There may be no more personal, more individual an emotion or experience than grief. It is, by definition, a selfish act: just you and your loss. No one can determine for you the length, depth, duration or symptoms of your own pain. Cheryl Strayed is a case in point. Wild tells the story of how Cheryl overcame the guilt, regret, shame and profound sense of loss that overcame her after her mother’s death. Cheryl’s is a unique tale, as she is a fascinatingly individual character, but the film mines for the universality in her pain and redemption. Wild moves back and forth between Cheryl’s 1100 mile trek across the Pacific Crest Trail and the memories that haunt her, past and present braiding together to form a clear picture of the woman emerging from her pain and the pretty jaw-droppingly dangerous behavior that pain wrought. Though director Jean-Marc Vallee’s (Dallas Buyers Club) film gets off to a slow start, Reese Witherspoon’s performance – aided by the sometimes terrifying, sometimes tragic, sometimes funny events of Strayed’s journey – compel rapt attention. Witherspoon leaves her comfort zone, allowing Cheryl more vulnerability and ugliness than you might expect. Strayed is comfortable enough in her skin to examine and, eventually, accept all of her own failings, so presenting the character fully is a requirement for the film to work. Witherspoon understands this and gives easily the grittiest, most naturalistic performance of her career. Witherspoon spends an awful lot of screen time alone, Strayed’s relationship with herself the larger conflict than her relationships with the inhospitable terrain, weather, circumstances and occasional creepy guy. Her pain and self loathing are impeccably drawn, never maudlin or false, and in Witherspoon’s scenes with the equally impressive Laura Dern she sews the seeds that bloom in her time alone onscreen. The truth is that Strayed’s grief is not typical, and her behavior is certainly extreme, yet Vallee is content to create a somewhat safe structure for the adventure: the lengthy journey punctuated by nightmares and memories that give us a glimpse into the life Strayed was trying to shake off with her hike. Still, the understated approach allows scenes to breathe, and Strayed’s true alone-ness seeps into certain frames in a way that is deeply unsettling and yet triumphant. And there are no two words better suited to Strayed’s experiences than unsettling and triumphant, so Vallee, Witherspoon and crew were certainly doing something right. Good review Hope. 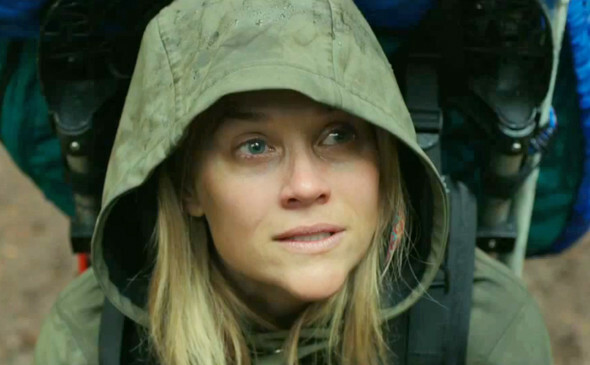 Witherspoon is as raw and emotional as she’s ever been before. Not only does she make the journey she embarks on all the more compelling, but also makes us believe in her as this Cheryl Strayed character. Even if it is a huge departure from what she’s played before.